Sometimes in life things happen by chance - and that is exactly how we found our future home. I was looking for a space to build a dental office in the Bay Area for about a year, but when a potential space fell through, I took it as a sign and put my search on hold for a few years to focus on my family. Fast forward to a few months ago, my fiancé Nick and I were headed to Aperto for dinner (had to get my spicy Tagliolini fix, yum!). I saw an online posting for a vacant retail space on the Hill -- it wasn’t on the market yet, but something about it caught my eye. Since we were a little early for our dinner reservation, we took a detour to look at the space. The office space was gorgeous -- floor-to-ceiling windows with the unique charm and character of a San Francisco building. The minute I stepped out of the car, I knew this was the place I was waiting for. My boss used to tell me that when you find the home of your future office you will just know. I didn’t believe her- but at that instant, I knew. And Nick knew, too. I remember looking at him and saying- “This is it, this is what we have been looking for!” So excited about the prospect, I texted Jane immediately. We were going to meet for breakfast the next morning and without hesitation she agreed to go see the office afterwards. The next morning, at 8:01am, I called the landlord and left a message. While Jane and I were at breakfast, he called back and told us there was a need for a dentist in Potrero Hill and that he was available to show us the space in 30 minutes. We scarfed down the rest of our food and hurried over to meet him. I don't remember much from that moment, except that the minute he opened those doors, we couldn't stop grinning from ear to ear. Not only was the space beautiful and perfect for our office, we knew we had found a great partner and advocate in our landlord. He is not the typical landlord - he is a down to earth, friendly guy and his sincerity showed through when he told us his one main requirement was he wanted a tenant who could serve the community. The building had not changed tenants since 1920, when it was the neighborhood butcher shop, then grocer, then convenient mart. 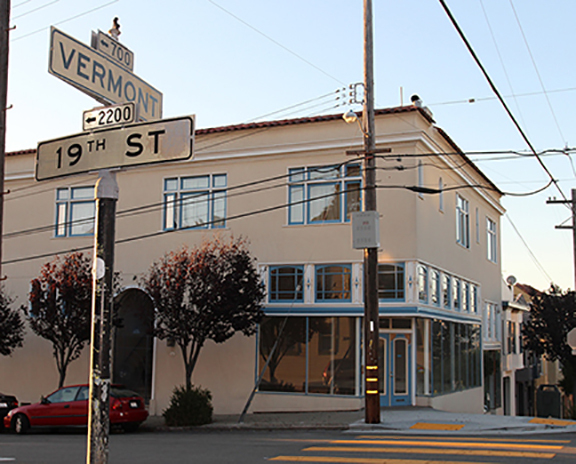 Since there is no dental office in Potrero Hill, we mutually felt it would be the perfect fit. Not only did we find a location we love but we found a place that is underserved within San Francisco- an ideal space for us to be able to focus on what we originally went into dentistry to do - help, care for, and improve our patients’ oral health. I think we took the landlord by surprise based on how fast we moved after that. We were determined to make it our future home and got all our ducks in line to make it happen. Now, 4 months later, I’m happy to announce we are 2 months into construction and ecstatic to join such a tight knit, friendly, and loving community. We have been met with nothing but support from family, friends, and neighbors and we are so excited to be able to say that Potrero Hill Dental will be opening its doors to the community this winter!